Recently, many readers have emailed me asking about how to choose the best Instant Pot pressure cooker, so today I’ll put my responses here for everyone’s interest. In fact, it’s defined as the insanely fast, intelligent electric cooker that has the functions of multiple cooking machines, including a pressure cooker, slow cooker, rice cooker, steamer, yogurt maker and warming pot. Beyond these basic functions that exist in most Instant Pots available now on the market, some others may come with additional programs, such as egg maker and cake maker. Obviously, how many additional features you get will depend on which model you’re going to purchase. About 2 years ago, I didn’t care really much for electric stoves as I thought gas stoves did better and saved me a lot of money in the long run. However, after knowing about the Instant Pot brand, my strong belief completely changed. The more I use it, the more I feel for it and I find it works even better than many other pressure cookers. It has made cooking so much easier, faster, and a lot more fun for me. Thanks to it, dinner is done and always ready to be served in less than an hour. Fast food has turned into healthy food right in my home. Still not impressed? Below are some of the most popular reasons that might convince you to invest in this kitchen appliance or use yours more regularly, from my point of view. Don’t you know that using the Instant Pot can impressively make your meals healthier Yes, you didn’t read wrong. I know some of you may question how nutritious are foods prepared through this way. So, allow me to explain it in detail. According to a study published in 1995, because this type of cooker is designed to reduce the cooking time, it reduces the negative impact on heat-sensitive nutrients. As a result, most of the nutrients and antioxidants in the food will be retained. Have I told you that the Instant Pot can effectively cut short your cooking time by up to ⅔? Yes, you didn’t read wrong, friends. Featured with a tight seal that helps protect the inside air and moisture from leaking, this cooker dramatically speeds up your cooking. This makes it a lot easier for busy people to have a home-cooked dinner ready on the table at the end of an exhausted working day. For example, instead of spending hours softening dried beans, you can get your dish done in approximately 40 minutes, about three times faster with the Instant Pot than when using the gas stove. Time saving is right there, don’t you see? According to the Instant Pot’s manufacturers, their products normally consume 70% less energy than many other traditional programmable cookers. As a result, it can also save you tons of money spent on utility bills. One of the reasons why I fell in love with this seven-in-one workhorse is that it makes cleaning up a breeze. Simple and compact in shape and size, it only requires a couple of minutes to clean the machine. Furthermore, its four main parts, including the outside/inside, the lid and the silicone ring, are all dishwasher-safe and super easy to take care of. Modern day pressure cookers are 100% safe to use. They’re normally featured with the locking lids, up to six-valve and vent safety systems which play an important role in preventing explosions or other serious mishaps. For sure, these quality stainless-steel designs will never explode. You can use them for many years to come. Which Instant Pot Models Should you Get? As far as I know, the Instant Pot comes in LUX, DUO, DUO PLUS, SMART, and ULTRA models. They all have a manual program, a stainless steel cooking surface and most importantly, the same safety functions. However, there are a few specific features that are programed in one unit but not in others. The LUX (price ranges from $60 to $110): LUX series models, the Instant Pot Lux80 in particular, are the most basic Instant Pot products, usually coming in 3-, 5-, 6- and 8-quart sizes. They all have 12 preset programs (Soup, Stew, Cake, Egg, Sauté, Rice, Multigrain, Steam, Porridge, Pressure Cook, Keep Warm and Slow Cook) and 7 preset temperatures. This is a good fit for those who are on a budget and do not plan on using low pressure cooking and yogurt making options. The DOU and DOU PLUS series ( price ranges from $70 to $130): They are the most popular models on the market today, which come as the “mini” 3-quart sizes, the 6-quart DUO60 and the 8-quart DUO80. Apart from all the basic functions present in Lux models, they can be used to make yogurt and cook at low pressures. 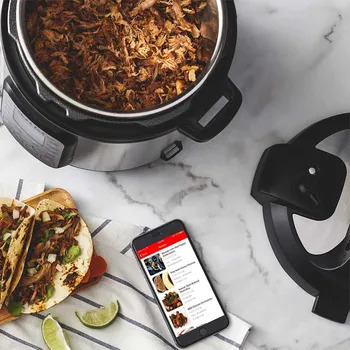 The SMART (price ranges from $160 to $299): The biggest improvement that sets the Smart model apart from other electric pressure cookers, is the self-controlled Smart Pot App which connects to the cooker from one’s phone or tablet via Bluetooth or Wifi. In addition to offering improved control over the cooking temperatures and duration, this intelligent app can also allow users to create their own Instant Pot recipes so that they can customize the results to their personal taste. More impressively, this model is now the only pressure cooker on the market that can pressure cook at any temperature sequentially. Beyonds 12 smart programs inspired from the LUX models, it’s also feature with two more functions: yogurt and cake. Due to these additional advantagements, its price seems to be a bit on the expensive side. However, if you don’t mind paying for quality, it certainly will never let you down. The ULTRA (price ranges from $150 and up): This model stands out for providing more capacities than other units from Instant Pot family. Well known as the 10-in-1 cooker, it can handle all kinds of cooking tasks listed above as well as permit you to make detailed, customised programs, regarding the cooking time, temperature pressure level and even the length of the delay time. Clearly, it brings about an easier life – so much more than we can imagine. Which Instant Pot Size is the best for you? There are now 4 different sizes available to choose from, consisting of the 3, 5, 6, and 8 quart. The size of the meal you plan to prepare as well as the size of your family will highly determine which is the right size for you. The 3 quart Instant Pot (aka the Mini Instant Pot): An ideal option for singles, couples, or small families with 2 members. The 6 quart Instant Pot (the most wide-used size): Large enough to do some batch cooking for a small to medium-sized family. The 8 quart Instant Pot (The biggest Instant Pot): Suitable cooking individual meals for a family larger than 5. At last, we have come to the most important reason for guiding you here today – our selection of the best Instant Pot models. Here’s our picks for the Best Instant Pots. When it comes to getting your cooking done in a short amount of time, the Instant Pot Duo60 seems to be an excellent choice for preparing a healthy dinner on the table without huge effort. This machine is equipped with a multitude of options which make a distinction between a high-price tag model and a traditional one. You can use it to sauté, slow cook and even pressure cook either with manual settings or with the push of a button located on the pot. I specially love it for cooking frozen meat, the essential ingredients to make really good soup and broths, as there’s no need to defrost it first. It cooks and defrosts all at once, saving you time and hassle. The stainless steel inner cooking pot is another trait that puts this Instant Pot Duo well above its non-stick rivals. With no chipping and dangerous coasting, no matter what has been cooked in it, this part is always easy to clean. In term of safety, this unit is UL and ULC certified with ten different safety elements and is built according to North American Electrical Standards. It’s kitchen-friendly and even when cooking, the external environment undergoes no minute temperature change, meaning explosions never happen at random. No more worries about your family’s safety. The only drawback that I have experienced is that the machine isn’t good for canning foods as it cannot maintain a steady heat or come up to a pressure high enough to perform this function safely. You’ll need a stovetop pressure canner to be safe. But wait, don’t panic! It has lots of safety features; as long as you follow the direction thoroughly, it’ll be fine. Truly, I’m very happy with this magical creature which not only exceeds my expectations, but also makes my life so much easier and healthier. If you’ve been toying with the idea of buying a pressure cooker, I honestly advise you to consider the Instant Pot DUO60 model. For sure, it’s a real deal with excellent performances. First and foremost, I am so excited about this product and all the possibilities it offers. Buying the model, you’ll have more manual options and the ability to write your own code for personal recipes – the special function that users are obviously going to want (reviews from Amazon’s customers). Built on the successful Instant Pot Duo Plus design, this smart model generates almost no noise, leaks no steam, traps food aromas, and cooks without heating up the surroundings. Beside all the components that it shares with the older versions, the Automatic Keep Warm program is one of the biggest differences that have to be indicated. With three temperature level settings (Normal, Less and More), foods can be hold at the desired temperature (up to 99 hours 59 minutes) until being served. It’s really beneficial for those who want to keep food just warm enough to comply with safety rules, but not so warm that it’s overcooked. Not only that, featured with the latest 3rd generation technology with an embedded microprocessor, the machine itself speeds up cooking by up to 2-6 times, consuming 70% less energy while producing nutritious, healthy and tasty dishes with consistent results. The bluetooth function that allows users to program and self-control the cooking progress from any smartphone is not absolutely necessary, but still, I’m a fan. To take advantage of this property, we need to use a free app called the Smart Pot app. Using this app, we can store and share all our favorite recipe scripts in one place. The script will of course list all the settings, ingredients, notes, times, temperature, pressure, categories and more for a specific recipe. To be more specific, after downloading and logging into the Smart Pot app, your Android or iOS gadget completely controls all the functions, connects instantly every time and makes everything very smoothly. Simply choose a recipe, and then push the “start” on the app, the cooker will automatically do its job which is already programed into the recipe and stops the procedure when finished. Apart from the ability to add the descriptions of the steps, serving ideas, importing a photo of the dish, this wonderful tool also comes in handy when you want to set multiple commands within a script. It has four different sounds to notify you when it’s time to add an ingredient, or when it’s done. Believe me, it’s definitely useful to receive cooking notifications or to be able to check on the progress of the meal via the phone, especially when being outside the house. This best Smart Bluetooth cooker is also super durable and totally safe to use. That is thanks to its 3-ply stainless steel inner pot button, which can eliminate all health concerns regarding non-stick coating. Firstly, although the Smart app offers a guide for users to design their own recipes as a sequence of actions, there is no way to export/import all the content on different phones. If you want to change your phone or factory reset it, you will lose all the records. Secondly, it’s extremely hard to clean the outer ring where the cooker lid sits. Although, most of the time, nothing gets into this part, it can be a pain if you have an accidental spill. So far, the device’s technology and convenience of using its app to store any recipe that has been created along with cooking/timing instructions really excites me. If you’re an adventurous person in the kitchen like I am, the Instant Pot Smart Bluetooth 6 Qt will surely be worth putting on the buying list. Note: For those who require more improvements, there is an innovative new programmable pot that provides outstanding flexibility to enhance the cooking experience – the Instant Pot Smart WiFi. The Instant Pot Ultra electric pressure cooker, which is customizable, is the next generation of the Instant Pot family. After hours of review, I’ve realized that everything you could normally cook in a crock pot can now be done in this versatile multi-appliance. It is a real advancement over some other cheap pressure cookers. The deciding factor for me is its Ultra button. For those who haven’t already known, the Ultra button is the sous vide cooking feature. It allows users to set a specific low temperature from 104 to 208 and then to cook at that set temperature in a zero pressure vacuum. This means the machine is both a pressure cooker and a zero-pressure cooker (for sous vide mode). Getting both for the price and space of one sounds impressive, right? Unlike most other pressure cookers, this model does all the different kinds of cooking tasks pretty satisfactorily. I’ve already made chilli with meat and beans, pressure cooked a stewing hen and steamed hard boiled eggs and white rice too. And all the dishes could not have turned out any better. Another feature you will definitely enjoy is the LED display. It’s bright and easy to read. Although it does take a little time to get used to maneuvering around the panel, the dial always offers easy access and adjustability. The preheating, cooking, and warm graph is also a handy visual prompt to have. I’m immensely interested in the audio prompts (jingles) which let you know that it’s in place when opening and closing the lid into position. So, rather than going with the Duo, Lux, or Smart model, why should you invest in the Ultra? Let me be frank here: (1) It looks more sleek with the added features of no pressure and customs temperatures. (2) It is updated with an auto sealing valve, a larger screen, extra cooking programs, an altitude adjustment, a cooking indicator, and a steam release reset button. These new components promise to offer more customization and convenience over older models. In particular, while the altitude adjustment gives better control for greater precision cooking, the pressure release button is great for quickly stopping the cooking process to prevent overheating. It also does a good job of protecting you from any possible damage caused by the steam as it’s released. Not sure if it’s a downside to this top electric cooker, but its quick release seems to be defective. In fact, I have to push down really hard so as to release the steam. Honestly, it is a little frustrating, at least to me. Plus, there’s surprisingly no instructions on how to use the machine. You have to rely on bloggers or other people on the Internet to get the hang of it. Therefore, if you’re not a master of pressure cooking methods or don’t want to spend more than an hour researching how to use the product safely, chances are high that you will be dissatisfied with this item. All things considered, this unit is built pretty well, since the vast majority of small kitchen appliances are so poorly constructed nowadays. I haven’t had the chance to test all the features yet, but so far all the functions I’ve tried seem to work quite properly. Highly recommend this sweet creation. If you’re a busy homecook, like me, you’d have already known how much convenience a mini pressure cooker can bring, and the one included in this deal is not an exception. With a tiny size, this small Instant Pot seems to be designed to make itself unnoticeable over your lovely countertop. On top of this, it features 10 safety modes allowing buyers to prepare their meal without being nervous. A great bargain for first-time owners of a contemporary kitchen appliance. The device uses less power than its bigger brother – the Instant Pot Duo 6-quart, nor does it have some of the preset buttons the bigger Duo has. However, it’s still an ideal companion that can be exploited as a rice cooker, a pressure cooker, a slow cooker, a steamer, a yogurt maker, and a warmer. The quality of all its components, especially the stainless pot, are definitely awesome. It’s a win-win for reliability and durability. As many others have said, stainless is the way to go, and cleanup is never going to be a matter. For extra accessories, this 3-quart baby comes with a cute little rack, a rice cup, a rice paddle and a soup spoon, providing all kinds of needs for every individual and family. Although not really a drawback, the fact is that the machine is not very intuitive if you have never used it before. So, to take full advantage of the many things it can do, you should read the manual first to understand all its settings and functions. Also, the valves don’t seal properly, which results in a jet column of steam escaping. This means you don’t always know to which stage your food will be cooked. Moreover, though it has a perfect size for most of my needs, it could be less efficient for cooking a whole chicken, a big pot of soup or for a large dinner gathering. It’s too small to perform all those uses skillfully. So, I would recommend a bigger one if it’s to accommodate more than one person. Whether you want to eat healthier or would rather spend your evenings hanging out with your family than in a kitchen, do yourself a favor and give this handy pot a go. So far, it has been doing an incredible job, richly deserving to be a trustworthy addition to your kitchen armament.